Handy single-portions to take- and give-away. 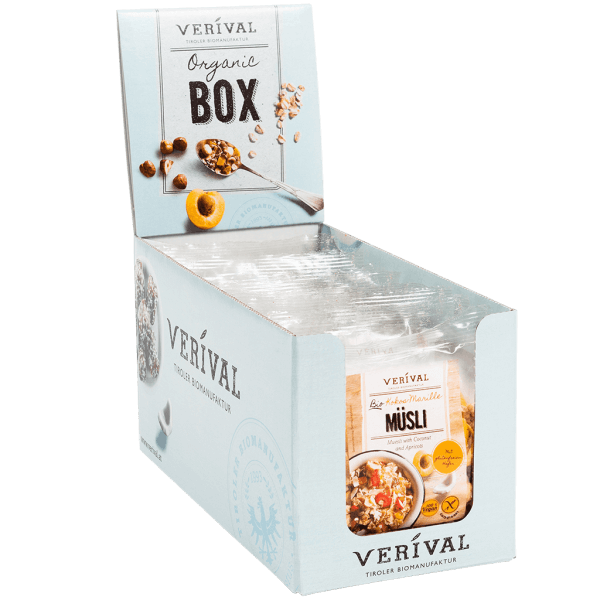 Gluten-free oat flakes and crunchy oat clusters blended with cornflakes, sultanas, lightly toasted coconut chips, apricots, sunflower seeds, almonds and forest berries. 100% organic. Good morning! almonds*, berries* 1% (strawberries*, raspberries*). *) Certified organic. > May contain traces of other nuts, lupines, sesame and soy. Best enjoyed with fresh fruit, milk, yoghurt or quark – but also perfect on its own as a healthy snack or nibble.